Various shipping companies are demanding a hefty $ 30 million from PdVSA for outstanding invoices. WILLEMSTAD - The Panamanian oil tanker Proteo is not allowed to depart from Bullenbaai. The ship is on the chain. 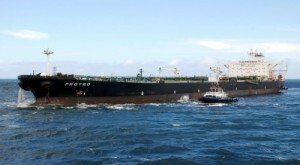 The cargo of Venezuelan crude oil has been seized. According to local Dutch newspaper Amigoe, this has been done by international shipping companies. They demand a hefty 30 million US dollars from the Venezuelan State Oil company PdVSA for outstanding invoices.